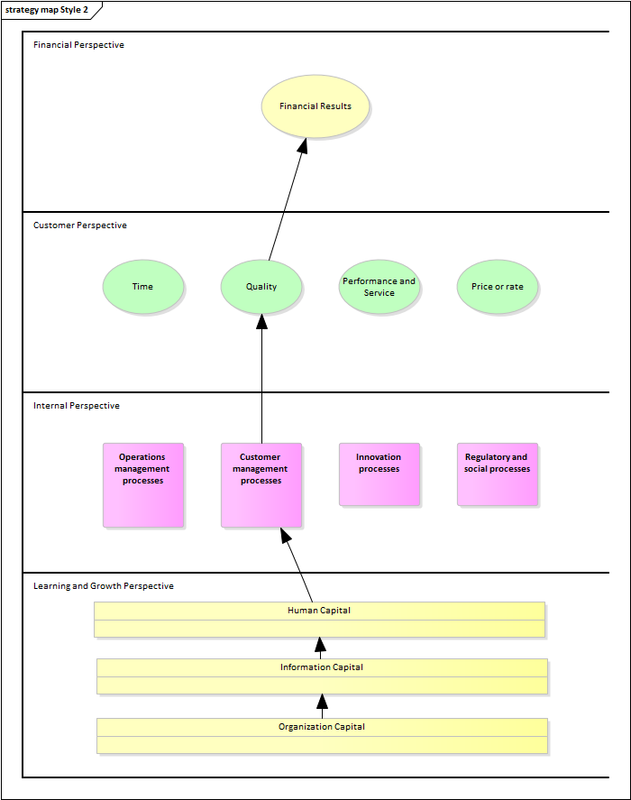 Strategy Maps are typically used for planning and communicating the overall strategy of a given organization in order to create sustained value for customers and shareholders in the form of a 'cause and effect' chain. Strategy Maps provide a greater emphasis on measuring and managing the value created by enhancing an organization's intangible assets. Intangible assets are items of value that can not necessarily be seen or touched. Examples of intangible assets include your brand, intellectual property, reputation, good will, patents, creativity and staff morale. A large percentage of an organization's shareholder and customer value is associated with intangible assets, yet traditional financial management systems fail to track, measure or evaluate them. As a result it is important that tools such as a Balanced Scorecard and Strategy Map are used to develop a more balanced approach to Strategic Planning. The ability to see 'cause and effect' relationships helps an organization understand the chain of events that sees intangible assets transformed into real value. 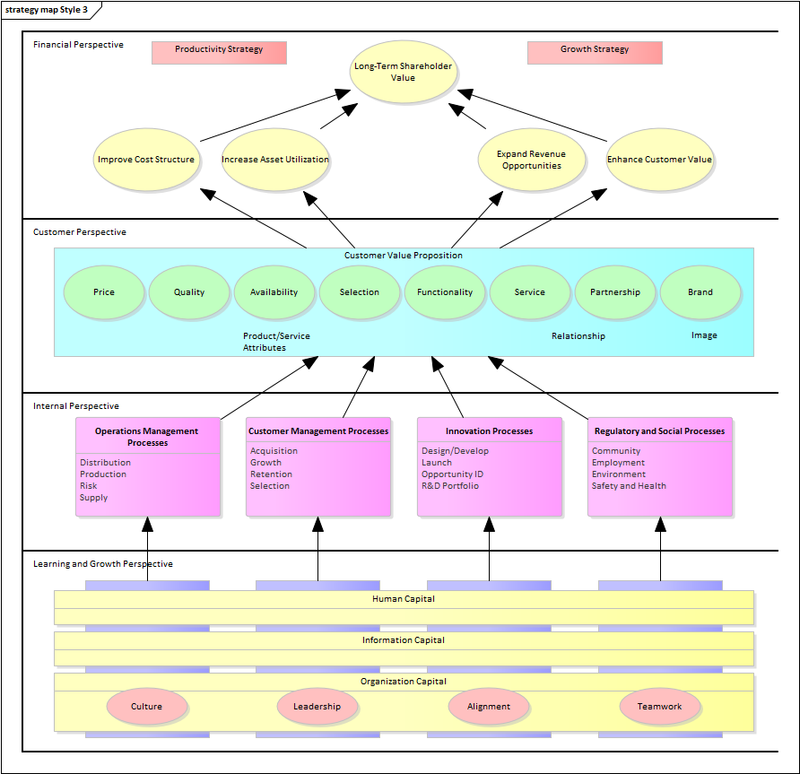 Enterprise Architect provides three basic Patterns that can be used to create a Strategy Map. 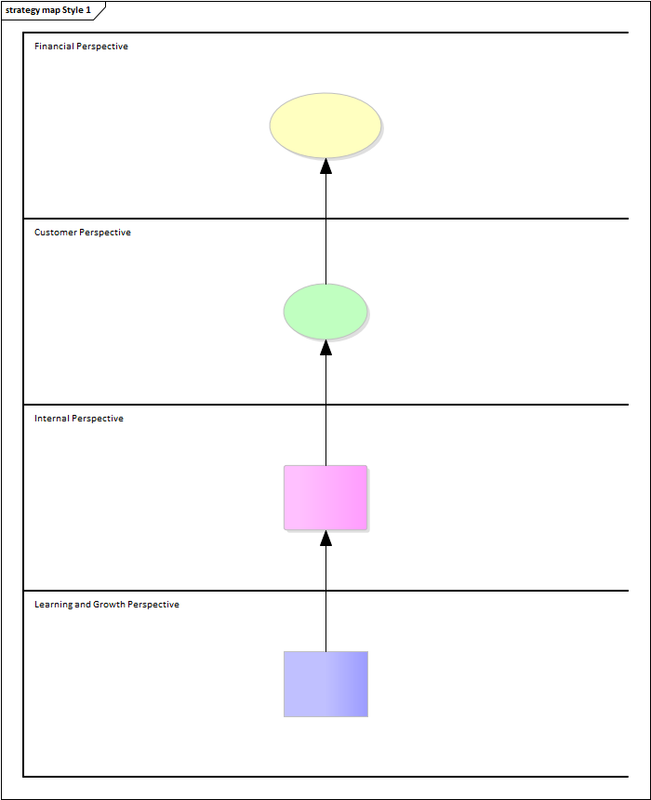 The first Pattern is very basic and provides the greatest flexibility with respect to the layout of your Strategy Map. The Toolbox provides a number of tools such as a mission and intangible asset. The second and third Patterns provide a more comprehensive overview, with far more internal processing and intangible assets. Strategic objectives are represented as an oval.